Just like in the novel ‘Going Postal’ where the Post Office competed hard against the Clacks, we at Backspindle Games have been working hard for the last year to bring fans another board game given life from the books of Sir Terry Pratchett. To all of you who play-tested Clacks over the last few years, thank you so much. Your feedback has greatly helped transform Clacks into a really good game. There are now three types of games that you can play in the box. There is a ‘player versus player’ game, a ‘co-operative race game against the Post Office’ and an introductory ‘two-player game for children’. We are extremely pleased with the artwork of Clacks created by The Artful Nudger, a.k.a. Amber Grundy. Not only is Amber a massive Discworld fan, but she is also a very talented artist as you can see from the box cover and base. .
At last the wait is nearly over… Some of you, like Cheery in ‘Feet of Clay’, may be trembling with nerves and excitement… others can’t wait to beat your friends playing Clacks. We can confirm the official release of Clacks will be at the Irish Discworld Convention in October 2015 and copies can be ordered for collection there in the pre-order. In addition we have a very special pre-order ‘giveaway’ for the first initial 300 fans to pre-order Clacks. Our pre-order shall ‘go live’ on the Clacks page at midnight on Monday 11 May 2015 (GMT). We are also delighted to confirm the Clacks with also be released this year in Polish by PHALANX and it will be called Świat Dysku: Sekary. We are delighted to confirm that Luchador! Mexican Wrestling Dice (2nd edition) is being reprinted in 2015 and will be available around October. A pre-order will go live before the summer. If you can’t wait until later in the year for the release of Clacks perhaps you’d like to come along at play the latest demo with us at the UK Games Expo from 29 – 31 May in Birmingham. Our stand is in the hall of Kings. We will have a very limited amount of copies of Luchador! and Guards! Guards! for sale at this year’s UK Games Expo so you may wish to visit us on Friday afternoon or Saturday morning. He has always been a fan of our games, a lover of Discworld and lover of Lego, so when the Mohican Runner (a.k.a Richard Hayes) took on a massive fund-raising challenge we felt the least we could do was offer him our support. For someone who only started running in 2012 to lose weight, by the end of 2014 Richard had raised over £4000 for the NSPCC by running 13 half-marathons in 13 months, a fantastic achievement! 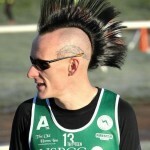 Richard has now taken a break from fund-raising and recently completed the London Marathon. We will be delighted to support him in the future. Well done Richard! This week has been amazing! An unbelievable amount of Twitter action at @backspindlegame with loads and loads of happy Kickstarter backers sharing pictures of their copy of Luchador! Our distributor in the UK, Esdevium Games had 600 copies, and had allocated all of them within the week….. We were delighted when they advised us of the buzz! They had to limit stores to a small amount before they all went…whao! Game Salute have approximately 900 copies to sell for us in the United States. Hopefully our games will be loved there just as they have been on this side of the Atlantic. We also got a big increase of followers on our Luchador! Mexican Wrestling Dice Facebook page, most of them Kickstarter backers. Thank you very much everyone! The Backspindle Boys Leonard and David were recently guests at the Replay Games Club, in Bangor, Co Down. (Thanks Gareth). There they ran a Luchador! tag-team tournament. It was great fun with lots of crazy team names, smack-talking and PIN shouting. The eventual winners were ‘We Don’t Know’ who triumphed in the final over the Replay Rancheros. We Don’t know were delighted and received a copy of the Luchador! second edition each from Leonard. Finally we did sell a few games today and do have some in stock if you know anyone who likes a easy to learn, fun, award winning family game for Christmas you know where to send them. Thank you all so much for the great BUZZ you have created! What a fantastic 2014 for our wee company. Best Family Game of the Year award for Luchador! at the UK Games Expo, a very successful Kickstarter project for the second edition complete with 3D wrestling ring, Championship Belts, New Wrestlers, Advance Fighting rules and more..
We sold out of all games at Spiel, Essen, are making great progress with our 2015 Discworld release, Clacks, and are well on the way to making an app for Codinca….phew. There are many people to thank, including Mark Rivera, Meowgod, our Kickstarter backers, Esdevium Games, Game Salute and Spiral Galaxy Games. Then of course there are our play-testers, local gaming groups (particularly Wee Gamers and Lisburn Gaming Club, friends and respective families, our game demoers, our IT support and video editor; nearly too many to mention. All of this support has meant we are delivering copies of Luchador (2nd edition) to Kickstarter backers two weeks ahead of the scheduled date (See, it can be done). Ok before we write an Oscar acceptance speech and get all teary eyed…..we just better get on with this and show you the sort of emotion we like to see when gamers play Luchador! Mexican Wrestling Dice. If you want a piece of the action you can order your copy here. US, South American and Canadian customers can order from Game Salute. In addition we may also have Luchador published in different languages in 2015. 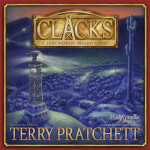 Discworld Clacks is getting closer to release; indeed we plan to go to print in March 2015 with a release in the summer. We have a talented illustrator on board and have just updated the latest prototypes. For two weeks we also have a Hogswatch Special Offer for Guards! Guards! That’s all for now folks. We’ll keep you posted as more happens. New Backspindle Games website is alive! We are delighted our new Backspindle Games website is now LIVE. Just in time to tell you that Luchador! (second edition) has now been sent off for printing. We keep our fingers crossed for no delays. Thank you to all the wonderful backers. If you haven’t already done so, please complete your survey on Kickstarter as soon as possible. Guards! Guards! was due to arrive with us today, but due to no fault of our own we are most likely to received the pre-order copies on Monday and aim to dispatch them on Tuesday of next week. By way of apology we will enclose a second beautifully illustrated Discworld character bookmark by Stephen Player with each pre-ordered game. On 18-20 July we will be attending BroCon, in Limerick where we will be play-testing Clacks and hosting a Luchador! Tag-Team Tournament. 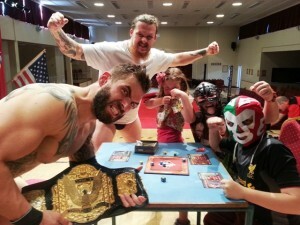 The game was once again a great success last week at the Wrestling.ie event in Newtownards. Development work is still ongoing with an app for Codinca. This is a new venture for us and hopefully will be completed and then enjoyed by many. 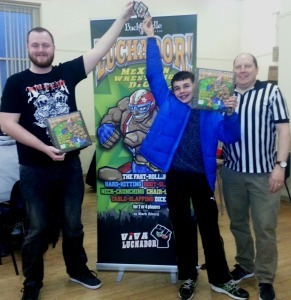 ‘Just one day to go’ and we have tablesmashed our funding goal on our UK Games Expo Best Family Game of the Year 2014, Luchador! Mexican Wrestling Dice. You can jump in the ring now and you get everything! Thanks so much to all our backers. You have been fantastic! The week that started on 1st June 2014 will go down as a landmark week in the Backspindle Games board game history archives! On Sunday 1 June at the UK Games Expo we were deeply honoured to receive the Best Family Game 2014 Award for Luchador! Mexican Wrestling Dice (1st edition) from Red Dwarf star Chris Barrie and doubly delighted that our Kickstarter project for the second edition of the same game hit its initial funding target of $16,000 on Saturday 7 June. ‘Pleased and delighted’ does not come close to how fantastic we felt. At this time we’d like to say a massive thank you to all those who helped and supported us with Luchador! in particular the designer, Mr Mark Rivera and our illustrator @meowgod . At the time of writing our Kickstarter is LIVE with just two days to go. Thanks to the fantastic backers we have already hit two Stretch Goals and hope to have one more really special Stretch Goal before the campaign ends. You can get in on the action here. Next weekend Backspindle Boys Leonard and Andy and a few other friends will be at the wonderful Q-Con both selling some copies that are left of Luchador! (1st edition) and demoing our other games. From July 18th-20th 2014 we will be at the growing gaming and anime convention in the University of Limerick called BroCon At it we will be running a Luchador! 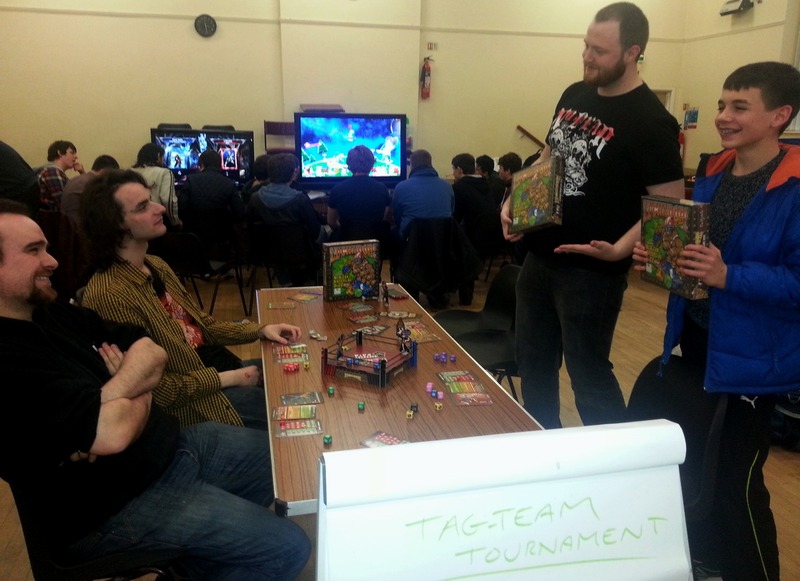 Tag-Team tournament and David has been invited to play a showpiece game of ‘Cards against Humanity’…..oh dear! Because we have been so busy with Luchador, we have had to put back our development of our new Discworld board game, Clacks. However as written earlier we will be demoing it at DWCon and will have copies of Guards! Guards! A Discworld boardgame for sale. As always we will be running a ‘Run around the Convention game of Guards! Guards! and David may be doing a little something else this year to keep you all relatively calm in the midst of all the shenanigans. Get ready for summer, conventions and fun! Luchador! 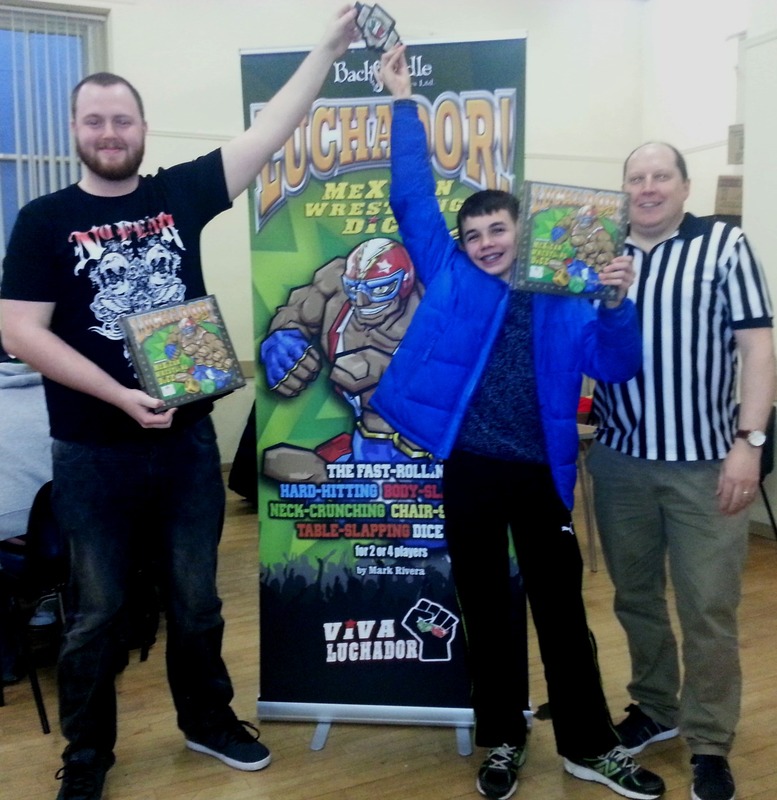 Body-Slams its way to victory at the 2014 UK Games Expo! Carlsberg don’t make weekends – but if they did I think we just had one. Three Fantastic days of meeting amazing game fans and some of the loudest and most enjoyable games of Luchador! Mexican Wrestling Dice, as designer Mark Rivera and the Backspindle Boys showed the UK gaming the public the ropes – and the head locks – and the table slams. It was great to see so many of our UK backers coming along to meet us. It was even better that so many people who had not known about the game have now pledged after playing Luchador! On Saturday 31 May we passed the $10,000 mark which is fantastic, and just to put a great big fat cherry on top of that Luchador! won the 2014 UK Games Expo award for Best New Family Game. Backspindle Boys Leo & David sharing the glory with Ross Jepson & Andreas Stein of Steve Jackson Games who won the award for Best New Abstract Game with “Castellan”. By 3 June we had 343 backers and are over 75% funded after just 8 days. We can’t thank you guys enough. We said in the introduction video on this campaign that we wanted to make Luchador! bigger and better. The enjoyment of all the fans who played Luchador! in Birmingham this weekend (not to mention the nice new shiny Award Certificate that says “BEST FAMILY GAME” on it) has told us we are on the right track. We are working now to get the last bits and pieces prepared for the second edition and are on schedule to have it ready to go to print as soon as this KickStarter closes. So keep sharing, keep tweeting and spreading the word guys. (If you don’t use social media then just open the nearest window and shout Viva Luchador! at a random passer-by). Thanks everyone Viva Luchador!